Crews have been completing overnight wet utility and hydro utility installation work at Forest Hill Station since September 2018; this work will continue through until mid-February 2019. 95% of all utilities relocation and installation work at Forest Hill Station have been completed. 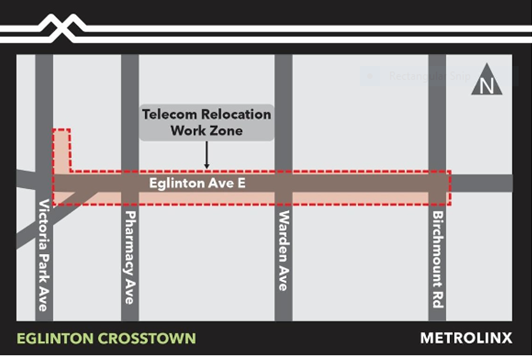 As part of construction of the future surface alignment for the Eglinton Crosstown LRT, crews will continue to relocate and upgrade existing overhead and underground telecommunication between Victoria Park Avenue and Birchmount Road. Telecom work has been extended until the Spring 2019.